With a stylish look, this packable go-anywhere backpack is for super-minimalists who make every gram count. Ultra-light. Ultra-durable. Ultra-awesome. The backpack is perfect for day-to-day use or occasional travel. Adjustable breathable straps make it easy and comfortable to carry for all day use, a great gift for everyone. 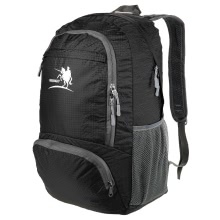 Made of highly rip resistant and water repellent nylon fabric, ultra durable for use. Features a classic stylish shape with several pockets for storage and organization, ultra awesome. Folded into inner zippered pocket to fit anywhere; Unfolded from pocket to be backpack. A roomy design–front zippered pocket to hold small accessories, and two side pockets to hold water bottle or umbrella. Stuff the bag into its own pocket for storage, a true space saver. Superior zipper design makes this backpack easier to open or close. The shoulder straps are strengthened with delicate bartack stitch. The zipper part does not repel water. Don&apos;t wash with liquid detergent or bleach. Clean with wet cloth if necessary. Please allow a slight difference in terms of sizes and weight due to manual measurement.